What’s Happening in Downtown Raleigh this Fall? Fall is one of our favorite times of year in NC. What better way to get out and enjoy the weather than coming to downtown Raleigh for a fun event or weekend outing. Even if there isn’t a special event going on, come downtown for a bite to eat, have a drink, visit a museum or just take in the architecture while strolling around. Don’t forget about First Fridays held the first Friday of every month. A great way to explore all downtown Raleigh has to offer. Here are some upcoming events in downtown Raleigh. The Irish Festival, featuring a diverse variety of entertainment for the whole family. Irish musicians, Irish bands, and Irish dancers will perform throughout the day. Irish and Celtic products, along with a great selection of area-produced gifts and crafts will be available for purchase. Children’s entertainment, and a wide variety of food and refreshments will be available as well. 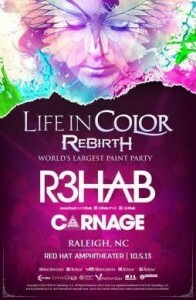 After the sold out event last year, Life In Color returns to Raleigh for the Rebirth Tour! On Oct 5th, witness one of the most spectacular shows in dance music featuring world-class DJs, soaring aerial acts, stilt-walkers, contortionists, fire shows, and more. Experience Life In Color! Come downtown to enjoy the Food Truck Rodeo with over 40 trucks that have committed. There will be tables and chairs along the way for on-street seating. The City of Raleigh Museum will be open and hosting activities. The start and finish of the marathon will be at Hillsborough Street at the Historic NC State University Bell Tower. For more great events in Downtown Raleigh visit the Events Calendar.